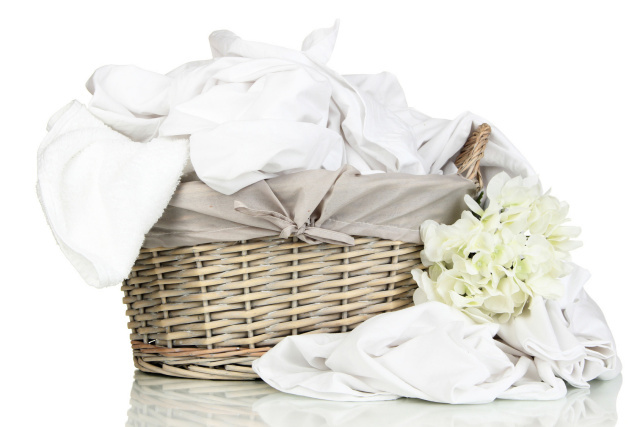 Keeping white linens white can be a challenge, so these tips should help you keeping them looking and feeling their best. I often mix whites on the bed, combining newer white sheets with vintage pillowcases. 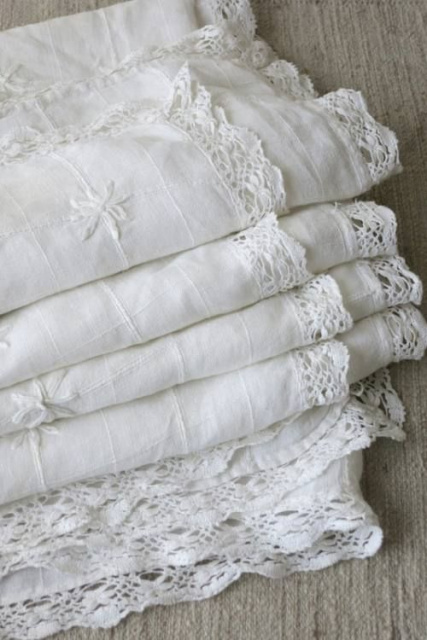 Vintage linens need a bit of extra laundering care, but they're well worth it! There's just nothing like the feeling of soft old cotton and they just add a special charm that I love. Wash in WARM WATER, not hot. Hot water can break down the cloth fibers which can keep them from staying white. Don't use bleach, which will eventually end up causing yellowing. Oxyclean or another oxygen based cleaner is recommended. Try adding 1/2 cup of white vinegar to your washer; vinegar both softens and whitens. Don't worry, your sheets will not smell like vinegar. For tough stains I've spot soaked with hydrogen peroxide with success on most items. RESTORATION laundry powder is the best stuff you can get, but it requires some steps to get the best results. I've only been able to find it online. If you love vintage linens like I do, the best way to store them is folded in an old pillowcase and put them in a well ventilated closet as this allows the fabric to breathe. Add a lavender sachet which not only gives your linens an old fashioned scent, it repels bugs too. If all else fails, you can tea stain the item. Wash the item first and make sure it is well rinsed. Don't dry it as you want the item wet before staining. Ideally you should then soak the item in a gallon of cold water with a tablespoon of vinegar to preserve the color. Then rinse well and hang to dry again.